The biggest problem is I purchased the victoria pro bundle. I turn off the firewall, and anti virus. I have the essentials installed. and I made sure to install the batch files in the My Library and also the one on the desktop it made. But she doesn't show up in my Daz Studio 4.5 I did install all files and when the installs came up with the warnings of not installing correctly I clicked the reinstall using recommended settings. and hit ok to update the files. Thanks in advance if you know a way around this. You can pretty much ignore that message, when it pops up. The older installers give it, under Win7, but I've never seen one not install properly. So, tell it 'Cancel' or 'This program installed correctly'. It's just Windows complaining that the installer wasn't specifically tailored to run under this version. I've tried importing new metadata but she is not on that list even after the install. And she is not in the meta data. Very few of the things I purchased show up in the meta data. She isn't the only model doing this but she's the most expensive one. I figure if I can figure out how to fix her it may fix all of them. Are you asking about the Victoria 4 Bundle, or the Victoria 5 Bundle? 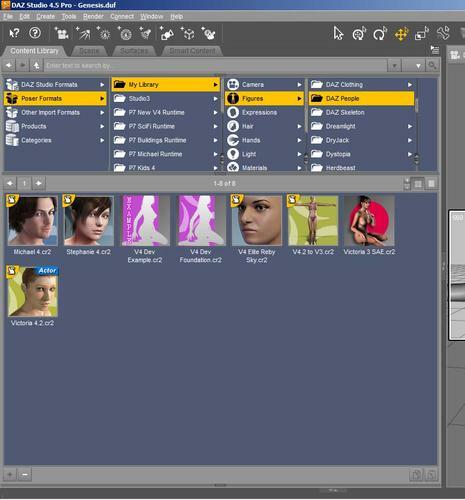 The V4 bundle is in Poser Format, and you will find the figure in the Content Library > Poser Format > My Library > Figures, assuming you installed it to the default My Library location. If it is the V5 bundle, then you will find the morph for Genesis in the Parameters tab under Actor > Female > Real World, and the materials are in People > Genesis > Materials > Victoria 5. All version of DAZ 3D figures prior to Genesis were in Poser Format. It's Victoria 4 not 5. I'm looking in my Libraries>Documents>DAZ 3d> (all that is here is Hexagon and Studio). So in Studio>My Library I see no Poser folder anywhere here. I didn't change the install path at all. The Poser folder inside the My Library folder is called 'Runtime'. You should have pointed the installer to The My Library folder in Studio. Where did the installer say it was putting the content? Is there a folder called 'content' in the My Library folder by any chance? "This script is not intended to be run standalone. It is intended to be run as a result of loading an ExP enabled "Victoria 4" based figure from the Content tab. Rename this file to match the name of the intended .cr2 to continue." You appear to be looking in DAZ Stuido Formats? You have to go to the Content Library tab inside DS4P, select Poser Formats > My Library > Figures > DAZ People to get to the content. Double click on the Victoria 4.CR2 icon, and it should load into the viewport. If the Content Library tab is not visible, go to Window > Tabs, and select it there, then you can dock it anywhere you want. 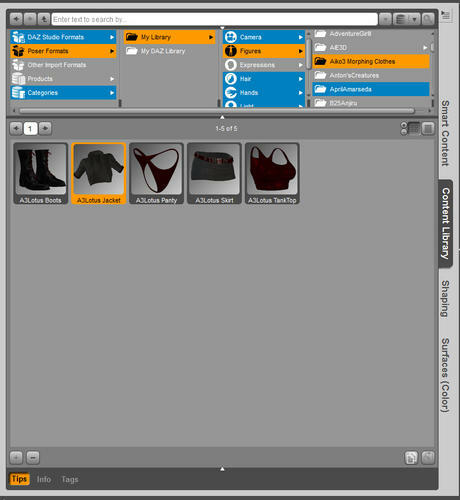 Using the content library I can get to access the materials for Victoria 4 but the clothing doesn't work or any other items I wanted to add. Content Library doesn't let me load any objects to the stage to be more specific. I don't think that you have My Library listed as a Poser Formats folder in your Preferences. Go to Edit > Preferences > Content Library > ontent Directory Manager, and post a screenshot of you collapsed listings for both DAZ Studio Formats and Poser Formats. Here's an example using Aiko3. Some reason with Aiko 3 the items import in but don't connect to the model selected. When you move the model the clothing stays behind. You have to go to the Parameters tab, and find the 'Fit To' option. That makes the clothing stay with the figure regradless of the pose. You can slo get to the Fit To option by right clicking on the clothing item in the viewport. Here is what happens when I use the Fit to option. This model is Vic 4.2 and the items I'm applying said they were compatable with that model including the hair. As you can see nothing lines up and her body shows through just about everywhere. The model you are showing in your image is NOT the default V4. It looks like you have applied the Aiko 4 morph, or some combination of other morphs. On the Product Page for these items, it shows you a list of morphs that the clothing contains. 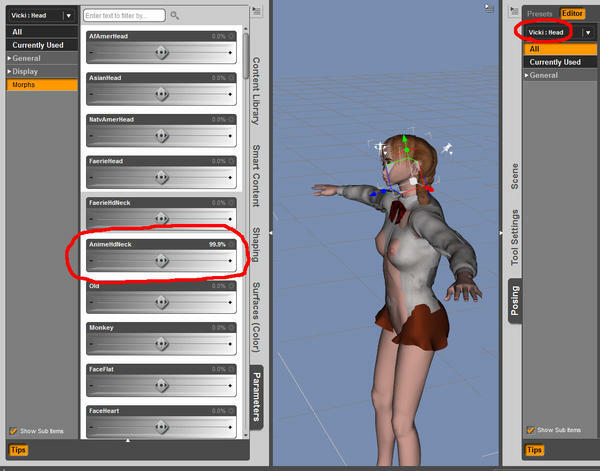 Select the Shorts, and look in the Parameters tab for morphs to make the clothing fit properly. Unlike Genesis, V4 clothing needs to have the morphs for any figure that you use in the clothing. Are you using the A4 morph, or have you added something else. Some of the items in your content tab say Upgrrade, have you tired using them? What is the name of the Hair that you are using? The only morph I put on Victoria 4 was the Anime Face morph. It didn't change the size of her head only around the eyes and the chin. This was changed in the Parameters for Victoria 4. Though a non changed Victoria 4 also has the same problems. The hair I'm currently trying is V4 Shingi Hair. I've tried every hair I have. I don't remember what the one in the picture is but they all look like that. I can't find that Hair in the store here, can you provide a link to it? There are two types of hair usually. One type is a Poser HR2 file, the other comes as a CR2 character file. The HR2 file will probably not conform to V4 (fit to), but the CR2 should do. An you show a screenshot of where the hair appears in the Content Library tab? I tried a few hairs that I have for Genesis on V4 and they work really well, as long as you DO NOT use the Fit To option? Weird, but it works. Try removing the fit to especially if the hair is a HR2 file, or made for another figure. This happens for every set of hair I have except Amarseda Hair. (The Amarseda Hair doesn't show up at all. but when i highlight in front of the model I can see it highlight but it's invisible) All other hairs attach to the figure like the one in the image. So this isn't a problem with what hair I'm using since all hair does this. Yeah the fit to is doing this but without the fit to they don't move with the head. Is there another way to attach it to the head? I have Shigi hair, and it 'Fits to' V4 perfectly. There are 5 fits supplied, one each for A3, The Girl, Stephanie Petite, V3 and V4. You must use the correct one. My image shows Shigi hair on the default V4 figure, which doesn't look anything like yours at all. You do not seem to be using the default V4. It looks very like Aiko 4, including the body shape? There are lots of morphs for adjusting parts of the hair, like making the tails shorter etc, but the hair will only fit the model it is suppled for. That looks like one of the Akio figures to me. Maybe Akio3. Yes, it's certainly a third generation zero pose. njbst18, how is the figure labelled in the Scene pane? Applied the Vicki material to Victoria 4 and changed the AnimeHDNeck to 99.9 circled both in red in screen shot to show this. All clothing even pants are not on completely. They are just as messed up as the hair. I still do not think you started with a BASE V4 figure. Which figure did you load to put the clothing on? If that was V4 the morphs would have groups down the left of the Parameters pane - I'm not sure it's not V1/2. Ah, I never went below V3. Did not think of the older versions. The OP really needs V4 for this to work properly. It seems somethings wrong with that Viki skin. If I do it without using the Viki model it works fine. Though I thought in the shop Viki was just a modified Victoria since it needed Victoria4.2 in order to use it. But doesn't work with any of Victoria's items. Not all Viki's are equal. If a item needs V4 it will only work on V4 and some times Genesis. V1 V2 and V3 are all different models with different shapes. V4 was the last in the line. V3 items work on V3 ect... Try to keep that in mind as you shop. Richard, those do look like V3 not v4 morphs. Even the stance and figure shape are V3 not V4. As an example here is V4 clothes on V3. It appears that if I apply any morphs to V4 her clothing doesn't morph with the clothes and they just pop through them. I think that's what happened. So do I have to look up presets and find clothing that matches the # of the morph I want to use? Or is there another way to alter her weight or build and get the clothing to fit? You need to look at the list of supported morphs when you buy items. It's included in the description's most of the time. The Artist that made the item will not include morphs for all morph packages. If the item does not have the morph included say She Freak morphs, item will need work to fit a figure using those morphs. If you are using the V4 base model, which you are not, all of the clothing will fit perfectly. Clothing for Gen 4 figures need to contain any morphs that you are using (unlike Genesis). In the previous version, DS3A, there was an option called Morph Follower, which did what you are looking for. That is now called Transfer Active Morphs in DS4P. How well it will work I do not know. You are not using the base V4 figure, what Morphs do you have applied to the base? If you look in the Parameters tab, you will see a Currently Used tab, and that will list any morphs that you have applied. Clothing for Genesis adjusts automatically to most of the forms that Genesis can assume, but it is a Generation 5 figure.